Thousands of mournful Copts from across Egypt continue to make their way to their main Orthodox Cathedral in Cairo, hoping to catch a glimpse of the body of Pope Shenouda III, who died Saturday afternoon aged 88 after 40 years spent leading the Middle East’s largest Christian community. An archbishop told the gathering crowds the funeral would be held Tuesday and in the meantime Shenouda's body is resting in full papal regalia in Cairo's St. Mark's Cathedral, sitting in the throne from which he traditionally oversaw services. 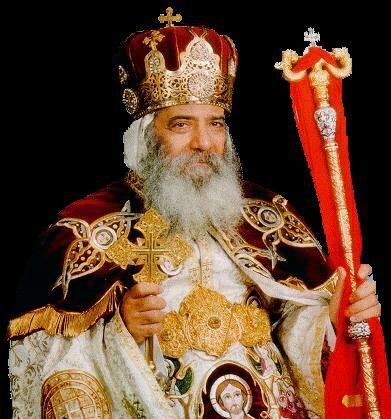 Shenouda died in his residence at the cathedral after a long battle with illness. In keeping with his will, he will be buried at the St. Bishoy monastery in Wadi Natrun in the Nile Delta, where he spent his time in exile after falling out with the late president Anwar Sadat. The head of the ruling Supreme Council of the Armed Forces (SCAF) Mohamed Hussein Tantawi and his second-in-command Sami Annan are expected at the Cathedral to offer their condolences. Bishop Pachomious of the Nile Delta province of Beheira has taken over papal duties for two months until a council of senior clergy meets to choose a new pope. Coptic Bishops from around the world have already started to fly in to attend the funeral and plan for Shenouda's succession. To assume the papacy, acting or permanent, a nominee must be an unmarried celibate monk with 15 years of service, Egyptian, and at least 40 years of age. To choose Shenouda’s successor, the Holy Synod Council identifies an initial group of nominees within 30 days. Following an internal vote, the Holy Council would forward names to a Nomination Committee, headed by the Acting Pope and including clergy and members of Board of the Coptic Endowment. The Nomination Committee would reject unqualified nominees and forward three to seven names to an Election Committee consisting of metropolitan bishops, heads of monasteries and their deputies and treasurers, and 12 priests from Cairo. The Election Committee would oversee a vote for three finalists. On the altar during Mass, from a sealed box with the names of the three highest vote getters written on slips of paper, a blindfolded young boy, selected at random from the congregation, would ultimately pick the next Pope. Ahram Online quotes Ekram Lamei, media adviser of the Egyptian Evangelical Church, this final step is designed to take in “the will of God." Issam Abdallah, a leading Egyptian Coptic liberal intellectual and writer, outlines today -- in a think piece for Elaph, the Arab world’s number one online newspaper – what he hopes would be the personality traits of Shenouda’s successor.